A lot has happened in February. 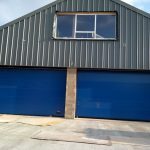 Here are some pictures showing the concrete apron, the garage doors, and some of the fit out inside including the ground source heat pump. The training room has been plastered as well as several other areas.